Okay, sorry. Now that I’ve gotten my Uncle Buck/bug-gnat-Nats reference out of the way, let’s talk about the squad’s injury issues and how they’re countering them. Daniel Murphy hasn’t appeared in a game yet, which is obviously disappointing to us and him. Murph has been an essential piece in the Nats’ offense the last two years, in which he’s put up a combined .334/.387/.569 line with 48 homers and 197 RBIs. That is a TON of power and run production missing from the lineup for 43 games. Howie Kendrick has made the bulk of the starts at second base in Murph’s place, further emphasizing how important it was to re-sign him this offseason. I’m guessing the Nats’ brass knew Murphy would be out for an extended period and consequently prioritized bringing Kendrick back. Howie has held up his end of the bargain, putting up a 116 wRC+, which is higher than his career mark of 107. We will all jump for joy when Daniel “Hits” Murphy comes back, but having such a capable, veteran fill-in like Kendrick has helped keep the Nats above water. The other starts have gone to Wilmer Difo, who also filled in at third base for Anthony Rendon while he dealt with a toe injury. 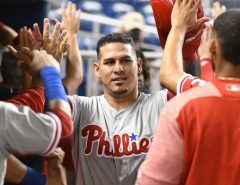 Wilmer, in addition to providing us with plenty of smiles and dugout shenanigans, has continued to prove to be a useful utility player, a notion that seemed suspect before he adequately replaced Trea Turner when the shortstop broke his wrist last year. 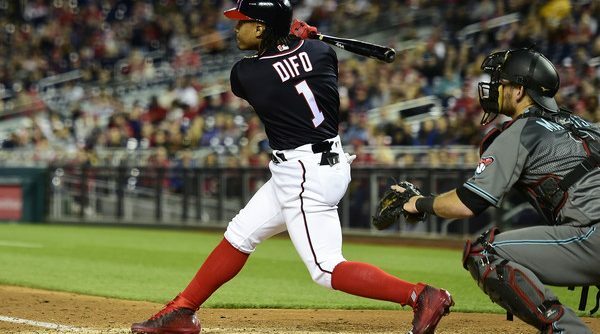 Difo has really come on as of late, in lockstep with the Nats as a whole, putting up a .333/.435/.538 line in his last 12 starts. Continued production from the little guy when he’s needed could be key to the Nats rising to the top of the NL East. Matt Wieters has only appeared in 23 games, currently in the midst of his second stint on the disabled list. This has given Pedro Severino a chance to prove his worth as a starter, and Nats fans should be excited by the results. Pedro seems to be working very well with the pitching staff and consistently flashes a rocket arm. The 105 wRC+ only helps matters. I think the Nats have found their long-term catcher. Then there’s Adam Eaton, who has been a boon to the offense in his very spare playing time these last two years. Filling Eaton’s outfield spot is where the Nats’ depth has reallllyyy been pressed, as Brian Goodwin has been out for an extended period as well. Matt Adams is getting run in left field, which is only….I repeat, ONLY….excusable because of his hot bat (169 wRC+). Andrew Stevenson’s playing time has skyrocketed for the exact opposite reason: he’s fast and has one hell of a glove, but the Nats won’t want a 73 wRC+ in the lineup too much longer. I’d rather not talk too much about Moises Sierra. He’s shown he can’t be useful to this team in any way. I realize Juan Soto is down in Double-A, but like, why not give him a shot? Regardless, I really hope Eaton can come back in six weeks as he’s stated he’d like to, and I hope Goodwin is not too far behind him. You may have noticed one Mark Reynolds jacking two looong home runs this past Sunday night against the Arizona Diamondbacks in a 6-4 Nats’ win. He’s now with the club because Ryan Zimmerman is fighting an oblique injury (although he’ll probably hang around even when Zim comes back, due to the latter’s struggles). If Reynolds can put up production similar to his career 105 wRC+, that will be another savvy move for a veteran by Mike Rizzo, a la the Kendrick signing. Whether or not the Nats continue to find production in the absence of important pieces such as Murphy, Eaton and Zimmerman will help define their season. Response to injuries has also been vital to the team’s success, or lack thereof, in recent years. In 2017, the aforementioned Turner injury looked to be a significant blow – then seemingly didn’t matter at all, with how well Difo played. 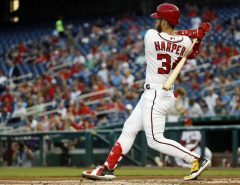 Bryce Harper missed 41 games with a knee injury – and the Nats promptly went 25-16 on their way to their second straight division title. In 2016, the timing and severity of the injuries to Wilson Ramos and Stephen Strasburg were undoubtedly consequential, as both went down right before the postseason began. I maintain that the Nats would have beaten the Dodgers in the NLDS if Ramos and Strasburg had been available. The closest comparison to what the Nats are experiencing this season has to be 2015. We all know how that went. Clint Robinson, Dan Uggla, Matt den Dekker and Tyler Moore all got significant playing time. Yunel Escobar, Danny Espinosa and Michael Taylor were forced to carry way too much of the offensive load. 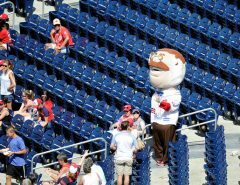 The Nats never truly recovered from that year’s rash of injuries and consequently missed the playoffs, even with monster years from Bryce Harper and Max Scherzer. Credit to Davey Martinez for navigating the injury minefield thus far in 2018. Getting this club to 24-18 with a 13-2 stretch over the last two weeks is a great accomplishment, similar to how Dusty Baker perfectly utilized his bench players in getting the Nats to 97 wins when last year’s injury bug hit. But one has to think the Nats are playing with fire with all these replacements in the lineup, as regression could always be coming. Let’s hope the ship doesn’t sink before the cavalry returns. All stats courtesy of FanGraphs and Baseball-Reference.com. 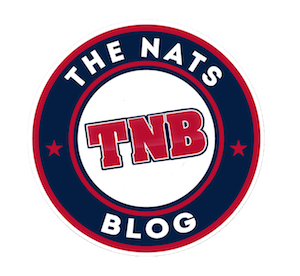 The Nats Blog is currently in the process being rebuilt due to an issue with our previous host. We will provide new content here and will work on making our archives available ASAP. Please pardon our dust in the meantime, and thanks for your patience. We are an independent news site dedicated to bringing you the best coverage of Washington Nationals baseball possible. We hope you enjoy.